You squat, you bend down, you pick up your kids. CrossFit classes are designed to focus on a variety of functional movements that we all do every single day. Our qualified coaching staff will help you improve your cardio, strength, and flexibility in an hour long class alongside a positive and encouraging community. M-F class times: 5:30am, 6:30am, 7:30am, 10am, noon, 4pm, 5pm, 6pm, 7pm (no 7pm on Friday). Our coaches specialize in helping you understand why you are in chronic pain. Our unique approach starts from the ground up where we uncover years of postural distortions, muscle imbalances and movement deficiencies. Then we develop a rehab program to not only help you feel better, but correct the dysfunction so the pain never returns. This is why we are referred by the top doctors of physical medicine in the area. Monday and Wednesday at 4pm. Frog jumps, inch worms, and bear crawls, oh my! At CrossFit Kids we're all about fun, fitness, and friendship so your kids can get a jumpstart on a healthy and active lifestyle the whole family can enjoy. Ages 6-14. Class times: M & W at 4pm. We work with a range of schedules to suit your needs. 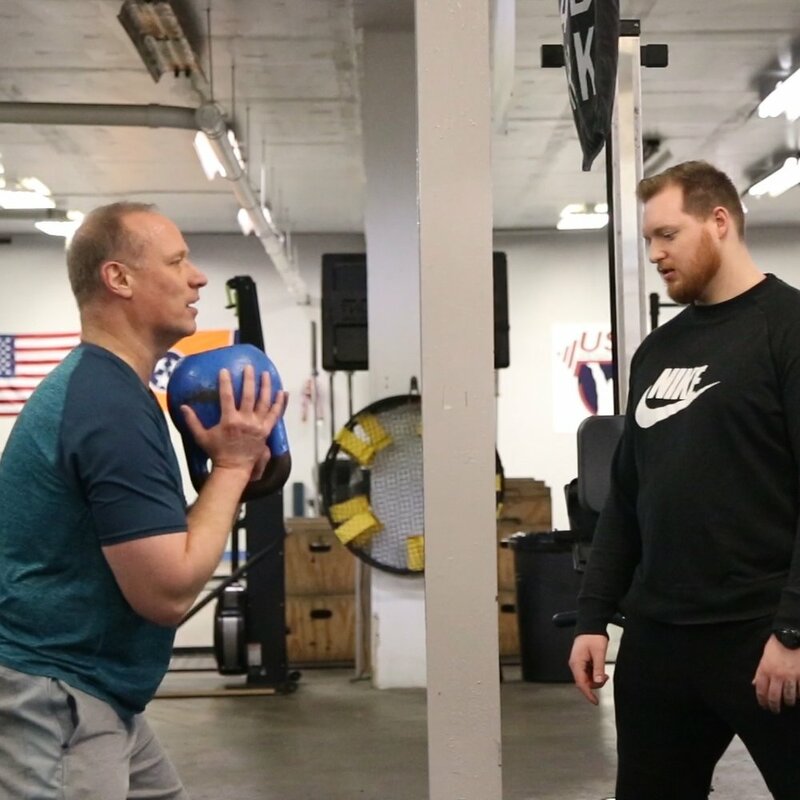 One-on-one coaching is designed to take out the intimidation factor of CrossFit and to help build confidence and a relationship with your coach. This is perfect if you are just getting started, wanting to improve your technique on movements and/or skills, or you just want to live an overall healthier lifestyle. Step 1. Schedule a free evaluation. The best way to figure out where you're going is to know where you're starting. We'll walk you through a series of exercises designed to determine exactly where you are in your fitness journey. You can expect a few crunches, squats and a jog or two along the way! Step 2. Schedule your one-on-one sessions. Based on your fitness evaluation we'll recommend a few one-on-one sessions with one of our experienced CrossFit coaches. You'll learn CrossFit movements, refine your technique and improve your fitness in the comfort of a one-on-one setting. Once your coach determines you're ready you can transition into our group classes where you'll be surrounded by a coach and community to encourage you along the way. The CrossFit Program was developed to enhance an individuals competency at all physical tasks. Our athletes are trained to perform successfully at multiple, diverse, and randomized physical challenges. This fitness is demanded of military and police personnel, firefighters, and many sports requiring total or complete physical prowess. CrossFit has proven effective in these arenas. What if I've never done CrossFit or don't currently exercise? The CrossFit Rhema program is meant to be scaled and suitable for all ages and physical conditions. Anybody that has a body can be an athlete at CrossFit Rhema. The philosophy behind CrossFit training is an all inclusive lifestyle change. Our program is distinctive, if not unique, in its focus on maximizing neuroendocrine response, developing power, cross-training with multiple training modalities, constant training and practice with functional movements, and the development of successful diet strategies. How much is a CrossFit membership? An unlimited membership is $150 month. 3 days week is $125 month. Personal training is $50 session (minimum 5 sessions). Our drop-in rate is $20 per class or you can purchase some CrossFit Rhema gear! We are offer student, military and first responder discounts.